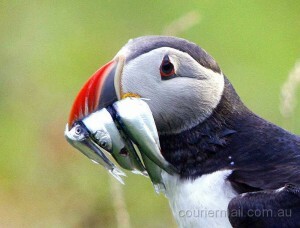 Atlantic Puffins truly are remarkable birds. Puffins can swim underwater and fly in the air. They have evolved their high speed wings and their rudder like webbed feet enabling them to swim efficiently underwater, where they catch small fish including herring and sand eel. They can dive to a depth of 200 ft and can stay underwater for 20 to 30 seconds. When underwater, the puffin is essentially flying, but it just has more resistance than in the air. How exactly does a Puffin manage to dive and swim through the water so effectively? Well, the Puffin partly folds its wings and has its hand wings directed backwards. Because of this and its ability to flap very fast, during the downstroke the bird accelerates upwards and forward through the water. Then, during the upstroke, the bird accelerates downwards and rarely also forwards. Most of the time however, the upstroke just causes the puffin to decelerate. Although they do not have the capacity to breath underwater for as long as a penguin, which can hold its breath for about 20 minutes, they have another attribute–very fast flight. A Puffin can flap its wings up to 400 times, which is actually so fast that it appears as a blur to the viewer. With this wing speed, it is no surprise the Atlantic Puffin can attain speeds approaching 55 miles per hour. 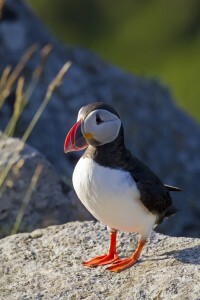 Although Puffins are not an endangered species, they are threatened by human activity. In many places Puffin population has dropped due to overhunting, overfishing in areas where puffins catch fish, and over tourism in areas where puffins need solitude to breed. In the following video some puffins dive off of ledges into the water and vigorously flap through the water. In the following video a puffin takes off and flies away. You say “A Puffin can flap its wings up to 400 times” … hmmm … it looks like you are missing a unit of time there! This is an interesting bird, they are obviously very good swimmers, as shown in the first video, yet they retain their flight abilities (unlike the penguin).